Karl Russell Boehmer, 68, passes away Friday, June 2, 2006 at his home in Crestview, Fl, with his family at his side. Born: On February 28, 1938 in Easton, Pa. he was a son of the late Mary and Floyd boehmer. Personal: He and his wife Carole Crothers, celebrated their 45 anniversary on October 15, 2005. 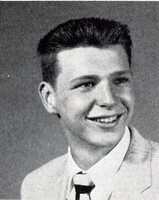 He graduated from Easton High School in 1956. He retired from the Air Force Reserves in july of 1998 after 26 years of service. During his retirment, he owned and operated Roger's Body Shop in jesup, Ga. Membership: He was a life member of the Optimist Club, Amvets, and the VFW. Survivors: In addition to his wife, Carole, he is survived by a daughter, Kerstin Sharp and her husband Jeremiah; three grandsons, Christopher, Matthew, and Logan Sharp, all of Ludowici, Ga; sisters Barbara Maiorana of Punta Gorda, Fl, Dorothy McDermott of West Yarmouth, Ma; and a brother, William Stone of Easton, Pa.
Services: Graveside services with Military honors will be held on Thursday, July 6, 2006 at 11 a.m. at Northampton Memorial Shrine. Memorials: In lieu of flowers, donations may be sent in his memory to the Hospice of the Emerald Coast, Crestview, Fl; or to the American Cancer Society.